There are MAJOR problems with this post, all centred around the word, ariyete, which I now believe I have translated wrongly. As soon as I can clear up the problems, I will report the Tablet, KN RA 1548, and modify the text accordingly. 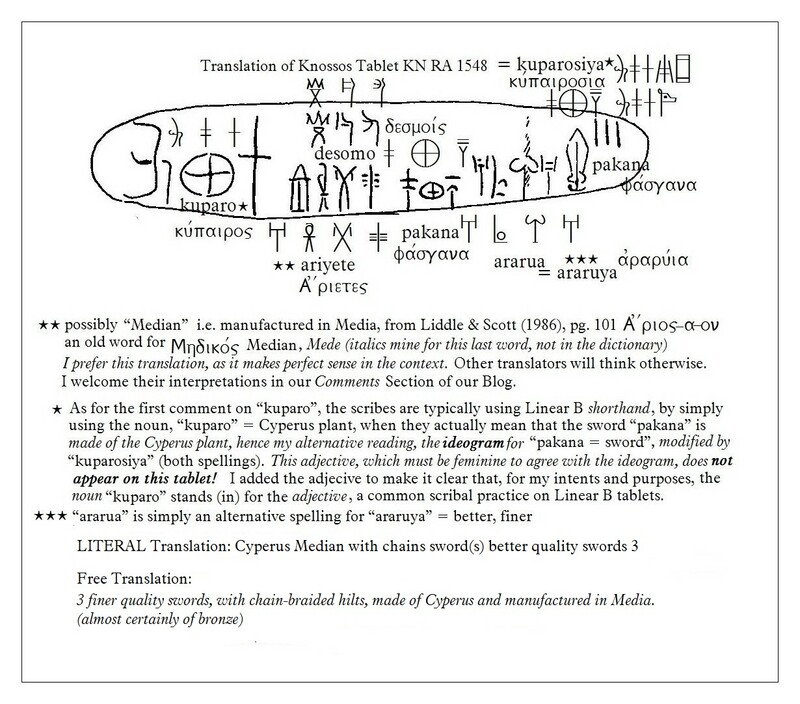 I also invite any Linear B expert to catch me out on this one, as I am quite certain you will. Apart from this tricky (sneaky) word, I believe the rest of the translation is accurate. At least my translation has the elegance of being consistent within its ambit. 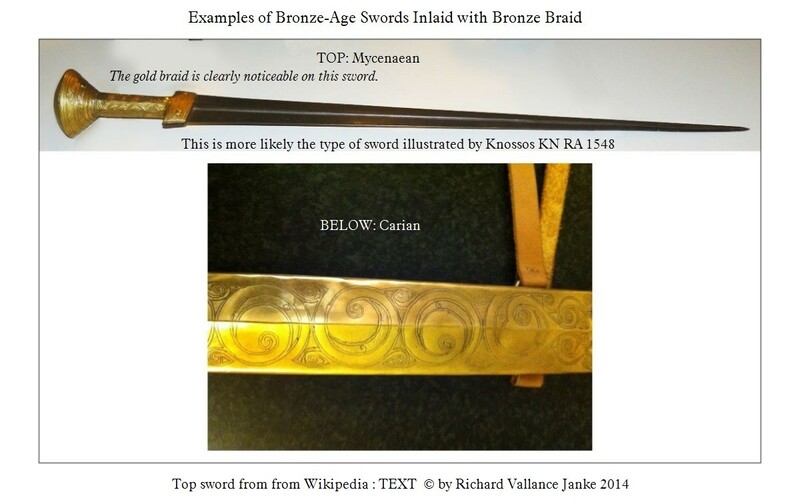 The swords here are described as “finer”, and there are only 3 of them in inventory, further attesting to their quality. Moreover, the attribution of Median origin of manufacture is not such a far stretch of the imagination, since as the map itself clearly illustrates, the Medians were a migratory people at that time, and the word for the people described as “ariyete” on the tablet bears a more than passing resemblance to “Arzawa” on the map. I am not at all claiming that my translation is the “right” one, as there simply is no such thing in cases such as this, with Knossos KN RA 1548, which is about as ambiguous as you can get. We must recall at all times that the Minoan & Mycenaean scribes were very adept at using shorthand in transcribing their tablets, since the tablets were almost invariably very small. That is why a literal translation is quite unlikely to represent accurately what they really meant when they wrote out their tablets. It is for this reason, for instance, that the noun “kuperos” stands (in) for the adjective “kuperosiya”, which in fact would be feminine, were it to modify the noun, “pakana”. So why did the scribes use the noun instead of the adjective? The answer is apparent... to save space on the tablet. Minoan and Mycenaean scribes resorted to this ploy over and over on 100s, even 1,000s of tablets, so is it any wonder they would have done so on this tablet? I welcome any and all observations, critiques and criticisms of this translation, however agreeable or, on the other hand, contrary or vexatious. Wonderful ! Every tablet tells a story bringing this civilization to life. Thanks Richard.